The Amazing Spider-man 2? Well, there was nothing amazing about the first film, and there is nothing amazing about the second film. Both films being directed by Marc Webb, they have the same directorial styling, the same love for extraneous sci-fi indulgence dependent on hokey plot mechanics, and the same tendency for buffoonish exploitation of comic book themes. The result: Webb’s own creation of a semi-nauseous melodrama. 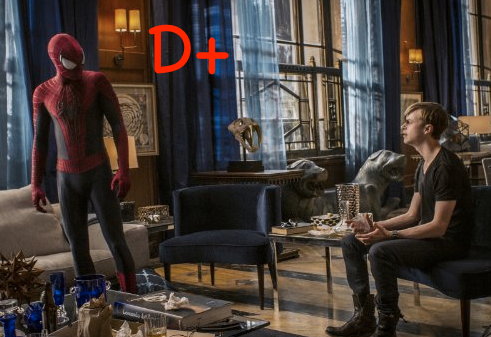 After the death of his parents, “Peter Parker / Spider-man” (Andrew Garfield) grows up as the questions about why his parents disappeared only grow stronger within him. 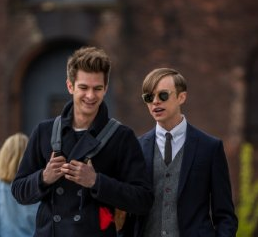 When his investigation into his father's research puts him on a path for a run-in with a company called Oscorp, various underworld forces move against him while Spider-man finds himself pitted against, not just an old friend (Dane DeHaan), but against his own principles as he struggles to keep a promise to a deceased man over his relationship with “Gwen” (Emma Stone). No new ground is treaded in part 2. It catches us up before the events of the last film and supplements the old story—a story not really augmented in any significant way here. But it does do one thing well, and that is showcase how the toughest battle for Spidey resides within his own head and not anywhere else. But…we knew that already. The over-suited bad guys (from Russian mobsters to rhino robots), the cartoonish attempts at comedy that happen during most fight scenes are a perfect example of why so many steer away from what is universally perceived as stupid-comic-book-riffraff-turned-stupider. Not a few good comic films are blackballed because of films like this one. 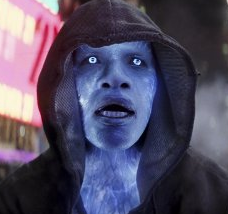 Jamie Foxx plays a stereotypically geeky techno nerd, “Max Dillon” (aka Electro) with “Harry Osborn” (aka Green Goblin) played by newcomer Dane DeHaan (the most devoted actor on board). Both are practically forced into their roles as villains when we are not ready to accept them as such. The tense emotional foibles – sometimes with genuinely touching human moments thrown in – don't have enough of the intended affect that they needed. Add in the familiar plot and you have a movie with fun action, mostly ruined by an "old hat" remapping, but nothing knew except bizarrely exaggerated CGI violence and characters so cornishly conceived that they could only be expected to suit ten-year-olds. I've stated before that there was no decent reason why the Toby Maguire Spider-man series needed revamping, and even with Garfield wielding a greater emotional range than Maguire could, the teenage-ish drama and suggestive super-hero violence (read: always casualty-free violence) doesn't ring true. Another thing that doesn't hit home: Emma Stone's Gwen who thankfully gets written out of the series by the movie's end. The film, of course, had nowhere to go but to write her out, and it should be considered a good thing that they did. The Gwen drama made the movie feel as if it was straddling between being a high-budget teen action flick and a preteen romance. It can never decide what it wants to be. As with many other modern comic-based movies, these super heroes always win. It's just a question of by how much. That means there is so little to lose, and therefore, so little to gain by watching. There is precious little by way of concern for the massive casualties that must result from battles like these, and yet so much more for the same familiar techno devices that tease (and insult) audiences. Unlike the irredeemably goofy first film, this one wins some points back for an ending that at least dares to take life as it comes at us.